AI already exists, it will likely get more streamlined and advanced. So? There are already programs that write programs, so it's not a huge leap to think there will be AI machines that create AI machines. We are AI machines. This is what people don't seem to get. There's not any difference between our brains and the brain of an AI machine, except arguably a few layers of emergence/complexity. 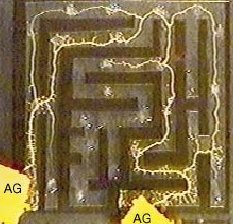 We're similarly "programmed" with all sorts of biological information, we're limited by our biochemical hardware, and our brains function exactly the same way a computer does, by turning a bunch of inputs into output. What bothers me about this Singularity business is the notion that lurks in the background, which is that "intelligence" progresses in lifeforms in a sort of steep line of reflection up the x-y-- pretty silly. The idea that you can abstract the "intelligence" of a person (as if it's some kind of essence) from the body itself and then simply inject it into other bodies is pretty ridiculous in its own right. The mind IS part of the body. If we can use computer chips or something to make our minds work more efficiently or better, we should do it. But for goodness sake, it won't be such a huge deal. We've already got microchips in there. Amino acids, proteins, nucleic acids, lipids. But aren't most of the Singularity proponents talking about what if we or something subsequent to us can overcome the limitations of out biological hardware and the limitations of having to make our environments with solid matter? What if human like or human level or better intellects can operate on super efficient hardware and inhabit practically infinitely designable software environments? Then taking the possibilities afforded by that scenario and projecting to the next iteration, and the next etc. Well I like the idea of protein machines, you could get all sorts of crazee designs on the go that were still 'biological' in nature. Sensory upgrades et al. I don't really think that machines can be conscious, at least not until these neural nets complexity reaches such a vast degree. Even then? Maybe if we make machines that can talk to us without ever being taught how to do so. Or what talking is, like babies have to. I can't see that happening though. I don't know if it is though, upon us that is, at least not by any definition that fans of the Singularity concept would recognise. The idea is that technological advancements proceed at an exponential rate eventually hitting an effectively infinite rate of innovation / change / improvement. That's the Omega Point or whatever. I'm not necessarily saying I believe that's how it will go down but that's what they say, and I can see reasons for thinking something like this might happen. But yeah, of course the process of technological development has been under way for some time, that's the basis of the idea anyway isn't it? Thing is, exponential increase just keeps getting gradually steeper and steeper, there's no sudden cut-off moment where everything goes "WHOOSH!" all in one go. I think the idea of the Singularity is that some breakthrough is made which enables not merely a quantitative change in the pace of technological innovation, which after all is happening all the time (Moore's law) , but a qualitative shift so that a graph of processor power or whatever vs. time effectively looks like a vertical wall. One possible catalyst people have mentioned already could be computers that are better at designing things than we are - genetic algorithms and the like. Another could be quantum computers, which (once some fairly substantial practical difficulties are solved) offer effectively limitless computing power. I think some theorists think they may even be able to solve problems that are even in principle insoluble to classical Turing machines (eg. common-or-garden computers as they exist today). Then there's work people have been doing with pieces of DNA, using base pairs as digits to perform immensely complex calculations...some people think DNA/RNA can unzip and re-zip much more quickly than it 'should' be able to according to semi-classical molecular dynamics, which means the nucleotides may be existing in quantum superposition before actually binding to the phosphate backbone to complete the reaction. I dunno if it counts as a fully-fledged subdiscipline yet, but people are already writing papers on 'quantum biology'. And some of them have a bit more of a basis in experimental reality than Penrose's magic tubules, too. Last edited by Mr. Tea; 04-11-2009 at 03:40 PM. "Effectively infinite". I don't think it's precise, I don't think that you can necessarily measure "technological developments" as proceeding at an "exponential rate", this is obviously an approximation to aid visualisation. Moore's law isn't a law either as such, but it's proved to be pretty close to the truth. I don't know if it's necessary that a specific technological breakthrough be made, though several of significance may be made along the way - Teilard De Chardin's original Omega Point thing had to do with a certain threshold level of complexity of organisation being reached in the Universe. I do, too! I am one. A protein machine where each protein is ultimately made out of only 20 amino acids. Which are in turn just amine groups with carboxyl group side chains. Which are ultimately just hydrogen and carbon and oxygen bonded in various combinations. Then there's work people have been doing with pieces of DNA, using base pairs as digits to perform immensely complex calculations...some people think DNA/RNA can unzip and re-zip much more quickly than it 'should' be able to according to semi-classical molecular dynamics, which means the nucleotides may be existing in quantum superposition before actually binding to the phosphate backbone to complete the reaction. Another could be quantum computers, which (once some fairly substantial practical difficulties are solved) offer effectively limitless computing power. I think some theorists think they may even be able to solve problems that are even in principle insoluble to classical Turing machines (eg. common-or-garden computers as they exist today). There is no reason to believe quantum computers can do that. QC can speed up some computations like the factoring of integers (which would be problematic for the kind of cryptography used today to secure the internet. I dunno if it counts as a fully-fledged subdiscipline yet, but people are already writing papers on 'quantum biology'. Others discuss if there's substance behind quantum biology. lively debate and do not necessarily express their actual views. I don't know how seriously to take what the people are saying. Is that so? Shame, I was probably getting confused with Penrose's quantum tubules again. Which can supposedly decide non-computational problems because they're quantum-gravitational tubules. Naturally! Never mind a lack of nerve cells, slime moulds don't even have separate cells - they're just a naked mass of protoplasm with nuclei strewn throughout. Lovecraft-tastic! The subconscious is to consciousness as the quantum world is to the classical world. Last edited by Mr. Tea; 06-11-2009 at 05:30 PM. Ok, I just waded through that, and that's not actually what they're discussing. They're discussing whether the effects of quantum physics are trivial in biological systems, which is a different claim. Quantum biology would be a superimposition of principles from quantum physics over biological processes, but not necessarily over biological systems as wholes, would it not? There are only very few known quantum algoritms (see this list), most are fairly artificial. The big one that put (the idea of) quantum computing on the map is Shor's algorithm for factoring integers. All known conventional (i.e. non-quantum) algorithms for factoring integers run in time exponential in the length of the number, which means they are very slow for large numbers. Essentially all cryptography that you use (whether you are aware of this or not) when you use the internet is based on (the hope) that no fast factoring algorithms exist. It is not known if Shor's algorithm can be implemented on classical computers. It is also not known if quantum computers can be built. That's brilliant. How do they do it? No, it's the same, just more politely expressed. The question is: do we to go down to the level of QM to explain biological phenomena, i.e. how the proteins work in cells, or can all of this be explained classically? The people who are argue for quantum biology all say: in the future we will find biological effects that can only be explained with reference to quantum phenomena. Their detractors say: there is currently no example where we know that it cannot be explained classically, please quantum biology guys & girls show us one. A strong form of detractors says: biological entities (like macro molecules) are too large to exhibit quantum effects due to decoherence.. I'm not a physicist, please correct me if I'm wrong, but I think the strong detractor's claim touches on an interesting open problem on physics (which is also key to the question whether we can build real quantum computers): can large systems exhibit quantum effects, or not. Nothing in quantum mechanics as we understand it today says there cannot be macroscopic quantum effects, but there seem to be serious obstacles to scaling quantum effects to macroscopic systems. They may just be engineering problems that will eventually be overcome, but it is also possible that there is a fundamental scale limitation to quantum effects which we don't understand. Biology is based on chemistry, and chemisty is based on quantum mechanics. However, for large systems, quantum mechanics (as far as we know) collapses to classical mechanics, and consequently we work with classical physics in biology. The claim of quantum biologists is that there are biological phenomena that cannot be explained classically. But macromolecules are made up of micromolecules, aren't they? And micromolecules are made up of atoms. I mean, genetic nucleotides are pretty small, and molecules bigger than that (Buckyballs, for example) have been shown to exhibit explicitly quantum-mechanical behavior, viz. diffracting when you pass a beam of them through a narrow slit. Then in the brain you've got nitrous oxide acting as a neurotransmitter, and that's only got three atoms - not to mention the individual potassium/sodium ions involved in the transmission of nerve impluses. Decoherence time is, AFAIR, inversely proportional to the size* of the system under consideration, so it's much longer for a single atom or a monocyclic molecule than for, say, a whole protein or something.